Rosemont is an unusually bright and airy estate home with large windows and graceful proportions. The Grand Foyer, with its gracious sweeping staircase is the focal point of the house. Painted in Rosemont’s signature red, the Grand Foyer soars to two levels, culminating in pillared archways in the gallery above. These archways echo the three large Palladian-style windows which invite in the afternoon light. Off the Grand Foyer to the north is the parlor, whose intimate conversation areas make it perfect for reading or enjoying a board game. Opposite and across the hall from the parlor is the former library and living room. It is now the dining room, or as we like to call it, the “Rosemont Room”. Its many windows afford guests an exquisite view of the exterior grounds in the morning light. Adjacent to the Rosemont Room is the strikingly handsome Nimitz Lounge, once the manor’s formal dining room, with exquisite oak paneling installed by Senator Byrd, Sr. If these walls could talk, we could learn of the many “off-the-record” conversations between prominent Washingtonians conducted here “back in the day”. The Nimitz Lounge, with its inlaid wood bar and glass-front cabinets, now serves as a receiving area for guests checking in to the manor. Step through a triple set of French doors at the south of the mansion, you’ll find our bright sun room that also opens to the Rosemont Room–the perfect place for relaxing or entertaining. For our overnight guests, the main manor house boasts eleven elegantly appointed guest rooms and suites, each named for an esteemed visitor to Rosemont during her 200+ year history. 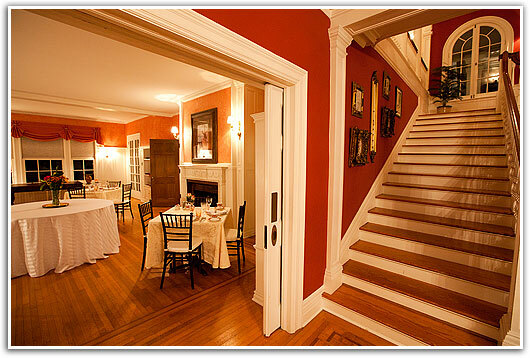 (The separate Byrd’s Nest Honeymoon Cottage is considered the 12th suite.) Each room and suite is equipped with its own full bath and individual temperature controls to make your stay as comfortable as possible. We’d love to welcome you to Rosemont for your overnight getaway, wedding or other special event, corporate retreat, or just for a cup of tea! Call 703-879-5683 today to learn more about making Rosemont a part of your history.